This image was taken during the peak outflow from the Gold King Mine spill at 10:57 a.m. Aug. 5. The waste-rock dump can be seen eroding on the right. Federal investigators placed blame for the blowout squarely on engineering errors made by the Environmental Protection Agency’s-contracted company in a 132-page report released Thursday. Condition at the Gold King Mine adit portal on July 14, almost three weeks before the blowout. Soil and rock had slid from the slope area and had buried a portion of the concrete diversion channel, including the ends of two drain pipes. Excavation uncovered mine timbers and lagging at 9:15 a.m. Aug. 5 at the Gold King Mine audit. Minor seepage is visible to the left of the date stamp where a small puddle has formed. 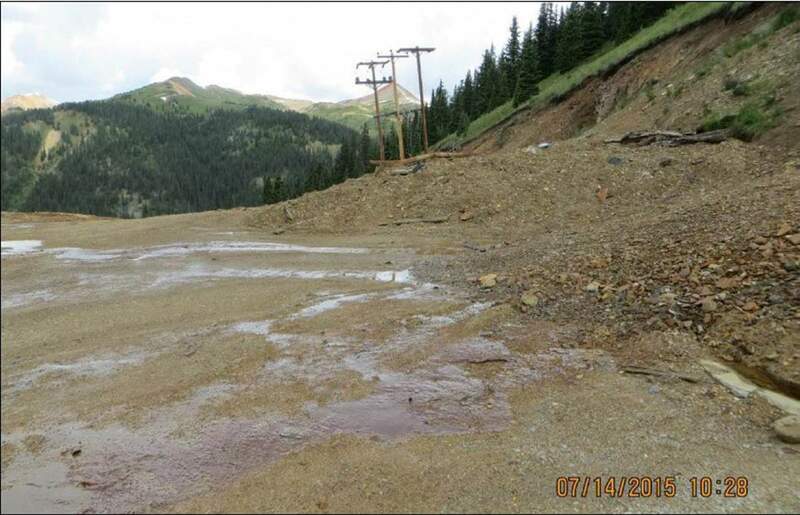 Seepage from the excavation at the Gold King Mine’s new portal at 11:48 a.m. Aug. 4, one day before the blowout. The flow is emerging about 5 feet to 6 feet above the floor of the adit. Wire mesh and rock bolts were installed to stabilize the outside of the mine opening, as seen in this photo taken Sept. 15. 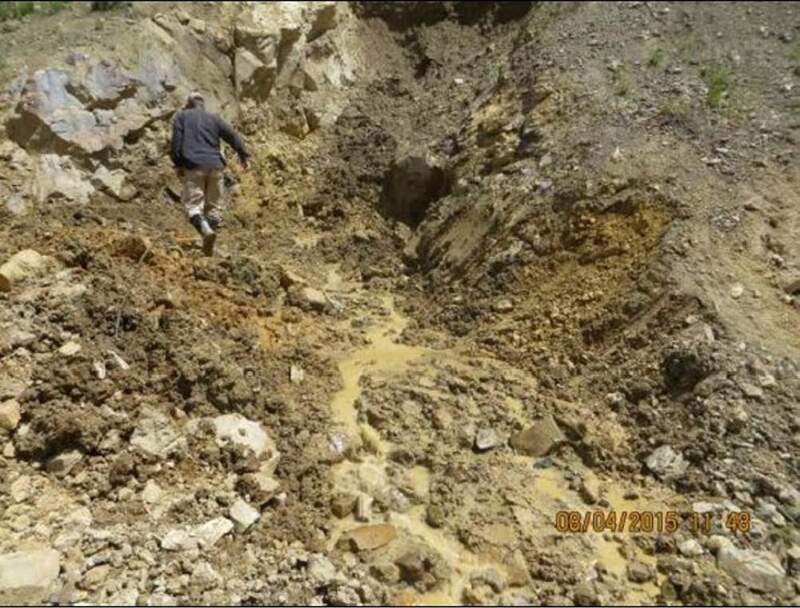 DENVER – Federal investigators said Thursday that engineering errors by an Environmental Protection Agency-contracted team “led directly” to the August Gold King Mine spill, which could have been prevented. The much-anticipated 132-page report from the Interior Department following the spill of an estimated 3 million gallons of acidic mining sludge into the Animas River, pointed to miscalculations and poor planning. “It was incorrectly concluded that the water level inside the mine was at a similar elevation, a few feet below the top of the adit roof. 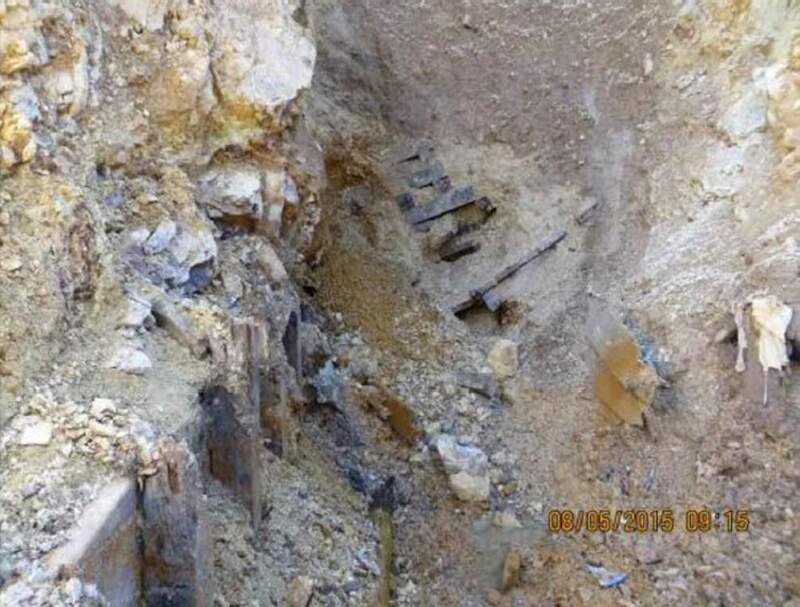 This error resulted in development of a plan to open the mine in a manner that appeared to guard against blowout but instead led directly to the failure,” the report by the Bureau of Reclamation states. The Interior Department was charged with conducting an independent investigation after national and international coverage of the event that turned the Animas River orange, shutting the river for eight days because of initial spikes in heavy metals, including lead, copper and cadmium. 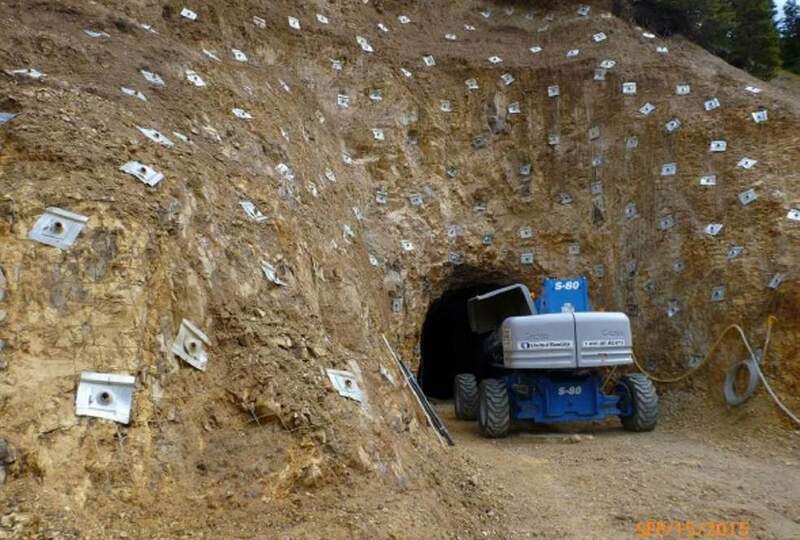 The investigation revealed that the EPA team should have drilled into the mine from above in order to determine the level of the mine pool. EPA officials said the agency is reviewing the report. “This report, in combination with the findings of EPA’s internal review of the incident, will help inform EPA’s ongoing efforts to work safely and effectively at mine sites as we carry out our mission to protect human health and the environment,” said Nancy Grantham, an EPA spokeswoman. The report is careful to point out that while the EPA team caused the incident, there could have been a blowout regardless. “With the passage of time, the continued sediment buildup would have made the ‘plug’ even less able to transmit seepage flow. Eventually, even if no action had been taken, it may have failed on its own,” the report states. Investigators also went on to highlight the historical context of the blowout, pointing out that the owners of the neighboring Sunnyside Mine installed bulkheads, increasing wastewater in nearby mines. Groundwater conditions in Cement Creek, a tributary of the Animas River, have also been altered by extensive underground mine workings, the extension of the American Tunnel to the Sunnyside Mine and the plugging of the American Tunnel. “I, again, want to strongly warn the public and the regulators of the potential for catastrophic future failure of the concrete dams placed in the American Tunnel by the operators of the Sunnyside Mine, which would result in a blowout of many magnitudes greater than the one EPA triggered at the Gold King Mine,” Gold King Mine owner Todd Hennis said in a statement. Gov. John Hickenlooper, a Democrat, said he is focused on making sure future incidents are prevented, damages are assessed and the EPA makes good on its promise to repair damages and compensate victims. Republican Attorney General Cynthia Coffman said the report adds a certain emphasis to any conversation on negligence. The report stops short of assigning fault to any individuals, despite prior claims from EPA Administrator Gina McCarthy that it would determine fault and any negligence. A U.S. Army Corps of Engineers official whose review of the conclusions was included in the report expressed “serious reservations” over the EPA’s failure to explain exactly how its communications broke down and why its officials were so insistent on starting work without more information about the complexities involved. Richard Olsen, a senior geotechnical engineer with the Corps, also questioned why a change in the EPA field coordinator for Gold King led to an “urgency to start digging” even though another EPA official had expressed some uncertainty about the potential risks. That second EPA official in July asked for an outside review of the agency’s plans by one of the Bureau of Reclamation engineers involved in Thursday’s report. A meeting between the EPA and the engineer had been scheduled for Aug. 14 – nine days after the blowout. The technical report on the causes of the Aug. 5 spill has implications across the country, where similar disasters could lurk among the hundreds of thousands of abandoned mines that have yet to be cleaned up. Some estimates put the total cost of containing this mining industry mess at more than $50 billion. 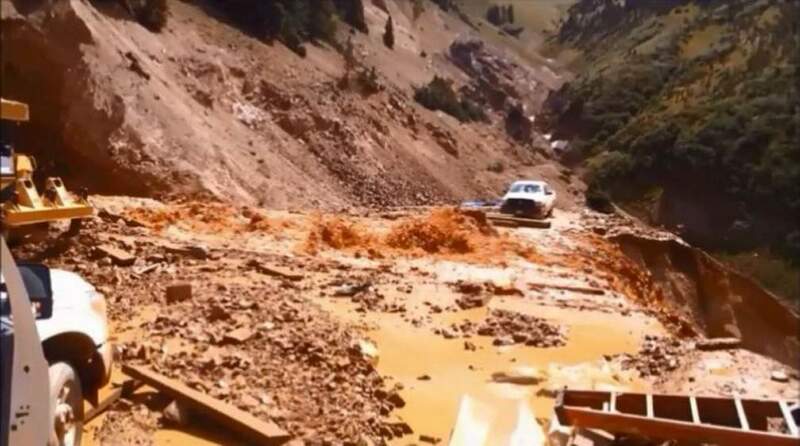 The report says the root causes of the Colorado accident began decades earlier, when mining companies altered the flow of water through a series of interconnected tunnels in the extensively mined Upper Animas River watershed. pmarcus@durangoherald.com. The Associated Press contributed to this report. 2009: Concerned that a cave-in was holding back water inside the mine that might someday burst out, the state of Colorado tries pushing a pipe through the debris to relieve the pressure. 2014: The state asks the EPA to reopen and stabilize the mine entrance because erosion from the hillside above has covered the pipe. Sept. 11, 2014: The EPA starts excavating the mine opening, but it stops because water begins to seep out, and a nearby holding pond might not be big enough. With winter approaching, work is halted until 2015. July 14, 2015: EPA returns to the site. About July 23: The EPA’s on-scene coordinator asks a Bureau of Reclamation official to visit the mine because the coordinator is unsure about plans to drain water. The visit is scheduled for Aug. 14 because the EPA official is going on vacation. Aug. 5: A different EPA on-scene coordinator, filling in for the one on vacation, is at the site. EPA and state officials agree to insert a pipe downward through the debris covering the mine opening to reach water inside and begin pumping it out. About 11 a.m., water begins spurting through the debris and then becomes a torrent. Eventually, 3 million gallons escape. Oct. 22: The Bureau of Reclamation report says the EPA underestimated how much water was inside the mine. The report said the blowout could have been avoided if the EPA had drilled into the mine from above, measured how much water was inside and then revised its plan accordingly.